A driver jailed for deliberately running over a pedestrian he thought was holding up traffic has previously been convicted of terror offences. 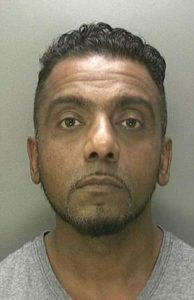 Shahid Ali sped off after driving over Patrick Colbert’s head and his body in his Mercedes in Balsall Heath, Birmingham. The 43-year-old, who dumped his car after the incident on July 11 last year, was acquitted of attempting to murder Mr Colbert but was convicted of causing him grievous bodily harm with intent. But it has now emerged Ali, of Washwood Heath, Birmingham, had a previous conviction for assisting in acts of terrorism. He was jailed for 27 months in 2009 for his involvement in sending four loads of equipment between 2004 and 2006 to Pakistan to be used against British forces and their allies fighting in Afghanistan. He had previously admitted causing serious injury by dangerous driving at Birmingham Crown Court. It was also an aggravating feature, he said, that afterwards he had tried to remove and obscure evidence by wiping his vehicle…. Ali then deliberately turned hard right knocking the pedestrian over and causing him to hit his head on the ground. But he didn’t stop and continued to drive over him slowly passing over the victim’s groin, chest and head….